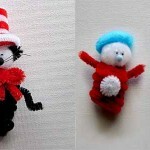 I never seem to run out of ideas when it comes to making crafts with pipe cleaners. Imagine how silly I looked this past weekend when my husband’s buddies saw me completely engrossed in twisting pip cleaners around my fingers! Yeah. I had a whole lot of ‘splainin to do! 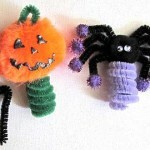 My finger puppet crafts are some of the most popular on Craft Jr., especially this Halloween puppet set – one of my personal favorites, too! Please refer to the original Easter finger puppets post for general assembly instructions. It explains the general instructions on how to wind the pipe cleaners around your finger and how to attach the pom poms accurately. First wind the two full lenth green pipe cleaners together around your finger tip to form the puppet base. Cut 5 pieces of yellow pipe cleaner for his straw ‘hair’ – make them slightly different lengths between 3/4″ and 1″ inch. Cut two 1″ pieces of yellow pipe cleaner for his straw hands – attach them by bending the wire to both ends of a 4″ piece of green pipe cleaner. It’s easiest to glue the straw hair to the inside of the hat, then glue the hat onto the pom pom head. Glue the mini red pom pom on for the nose, then glue on the googly eyes. Then glue his head onto the puppet base. First wind the two full length brown pipe cleaners together around your finger tip to form the puppet base. 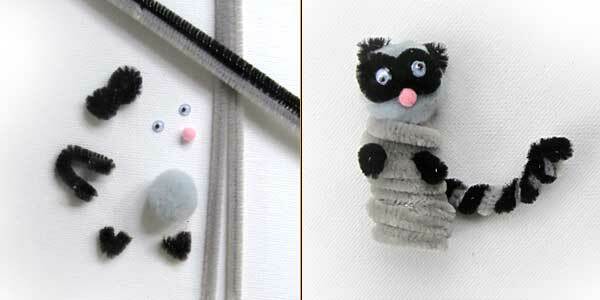 Glue a mini black pom pom onto the squirrel face for his nose, and then glue on the googly eyes. Snip two 3/4 inch pieces of brown pipe cleaner and bend them into a V. Glue them onto the top of the head for the ears. 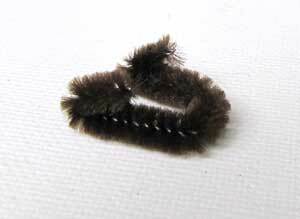 For the squirrel tail , use varied-width pipe cleaners and clip off one section, leaving the narrow part a little longer on one end. You’ll use this extra length to attach it to the back of the finger puppet base. Lastly, glue his head onto the puppet base. First wind the two full length white pipe cleaners together around your finger tip to form the puppet base. NOTE: For some strange reason, this owl looks much better if he is shorter than the others – I squished my coils together a lot on him. 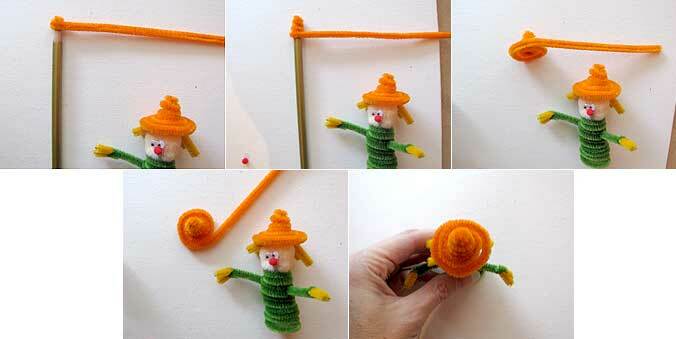 Bend a short 2-3 inch piece of white pipe cleaner into a tiny figure eight – you’ll probably need to clip off an end. 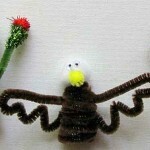 Cut a small 1″ inch piece of tan pipe cleaner and bend it into a V for the beak. 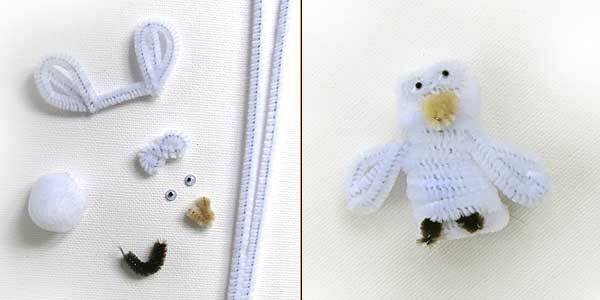 Glue the figure eight and beak onto the white pom pom, then glue the googly eyes into the centers of each loop of the figure eight. Bend a 1″inch piece of brown pipe cleaner into a simple U – slide it in between the coils at the bottom for his claws, just letting the ends peek out. Slide them in between the puppet base coils, and glue the head onto the puppet base. First wind the two full length gray pipe cleaners together around your finger tip to form the puppet base. 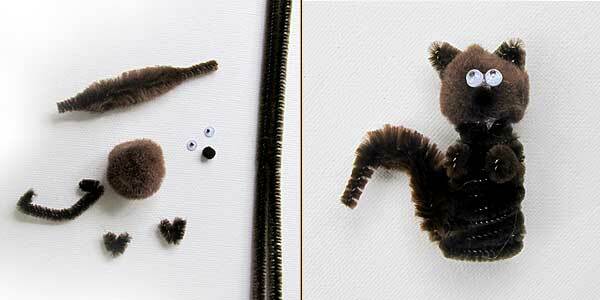 Bend a short 2-3 inch piece of black pipe cleaner into a tiny figure eight – you’ll probably need to clip off an end. Snip two 3/4 inch pieces of black pipe cleaner and bend them into a V. Glue them onto the top of the pom pom head for the ears. Then glue the figure eight onto the face for his ‘sunglasses’ eyes, gluing the googly eyes into the middle of the loops. Glue a mini pink pom pom into the center for his nose. Bend a 2.5″ piece of pipe cleaner into the form of small front paws – see the closeup in the squirrel instructions above. Slide it in between the coils. Leave a bit of straight length at the end so that you can attach the tail to the puppet base. 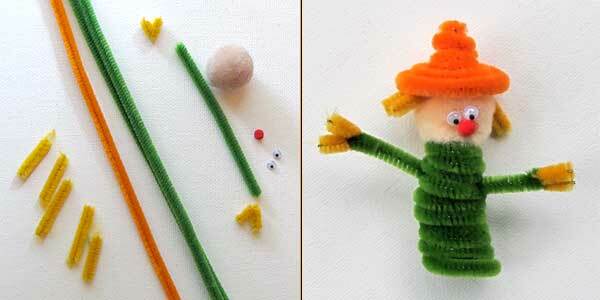 Glue a mini yellow pom pom onto the larger pom pom face for his nose, and then glue on the googly eyes. 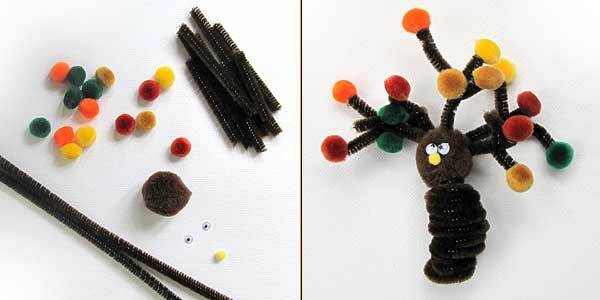 Cut 10-15 pieces of brown pipe cleaner for the branches – make them between 2″ and 3″ inches long. Twist two or three of them together randomly in the shapes of branches. Glue a medium sized pom pom onto most of the ends of the branches, leaving some empty. These branches can easily get too heavy, so don’t overdo it. Get a hefty amount of glue onto the other end of the branches and stick it right into the tree head. LOVE! 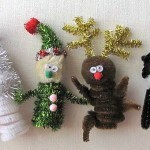 Of course you know how much I love all of these finger puppets you do, so DANG CUTE!! 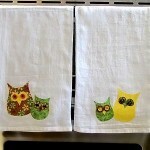 Hi 😀 I featured your tutorial at my Festival of Frugal Crafts. 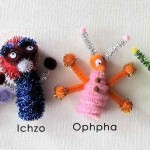 Cute finger puppets. It’s really fun to play puppets. I like the Rocky Raccoon and Cute Squirrel. Kids will definitely love this. Thanks for sharing this. How I do a chef finger puppet?